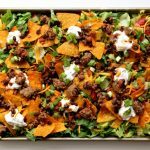 Instant Pot Forgot to Defrost Doritos Taco Salad–this fun spin on taco salad is made quickly even with frozen meat straight from your freezer. Use your Instant Pot to cook the seasoned meat quickly. Layer everything on a sheet pan and dig in for a delicious, healthy, family-friendly dinner. When you’re about to make dinner do you ever think, “Shoot! All my meat is in the freezer and I forgot to defrost!” I do this all the time. I love the Instant Pot for the reason that you can put frozen meat in there and still get dinner on the table in a timely fashion. It makes things so convenient. 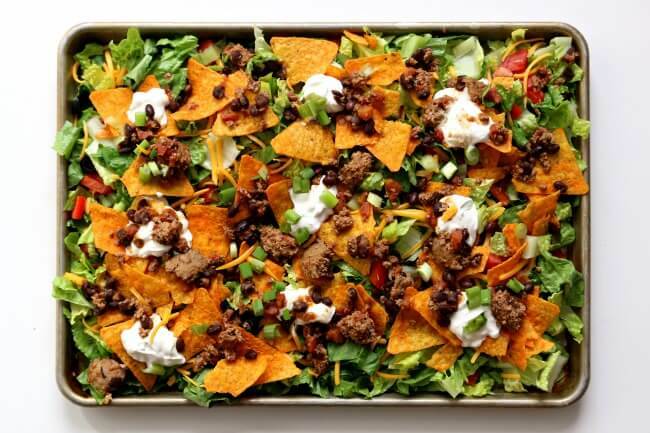 To make Instant Pot Forgot to Defrost Doritos Taco Salad I used my 6 quart Instant Pot Duo 60 7 in 1*. I love this Instant Pot because it has the yogurt making function which I use almost weekly. It has two pressure settings (high and low), and there are also little slots in the handles so that you can rest the lid there instead of putting it down on your counter-top. 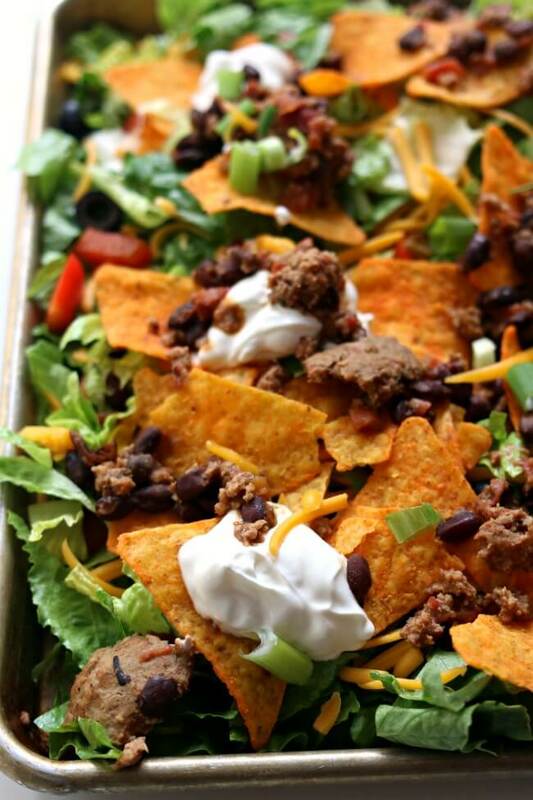 This fun spin on taco salad is made quickly even with frozen meat straight from your freezer. Use your Instant Pot to cook the seasoned meat quickly. Layer everything on a sheet pan and dig in for a delicious, healthy, family-friendly dinner. Add meat ingredients to the pot: Add broth to the Instant Pot. Toss in the frozen meat. Sprinkle the meat with the taco seasoning/seasonings. Dump the Rotel and beans on top of the meat. Cook the meat: Cover the pot and secure the lid. Make sure valve is set to “sealing.” Set the manual/pressure cook button to 9 minutes on high pressure. While the meat is cooking, prepare your salad ingredients. When the 9 minutes is up and the timer beeps you can perform a quick release by moving the valve to venting. Remove the lid. Brown up the meat: Turn your Instant Pot to the saute setting. Break up the meat with a wooden spoon. The middle of the meat will probably still be a little raw. Cook the meat for a few minutes until it is done all the way through. Let the liquid cook off of the meat. 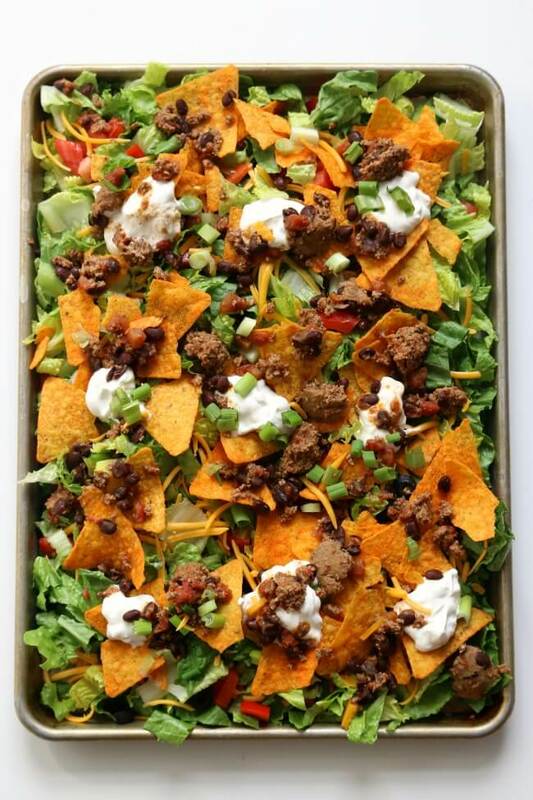 Like this recipe for Instant Pot Forgot to Defrost Doritos Taco Salad? Get all my new recipes delivered to your email inbox by signing up below.